When the NEC NP310 projector lamp is reaching end of life you’ll a warning message about replacing the lamp appear on screen. The LAMP INDICATOR on the projector will also start blinking red. You may also see that colors are off and the picture has become very faint. When any of this signs show, replace the NEC NP310 projector lamp immediately. The best type of projector lamp for your NEC NP310 projector is an OEM NEC NP14LP replacement projector lamp. Counterfeits often end up damaging the sensitive electronics in your NEC NP310 since they are prone to explosions. The substandard toxic materials used give these counterfeit projector lamps a much shorter life as well. The other concerns are the lack of proper safety guards for your eyesight. Save yourself the hassles and buy an authentic NEC NP14LP projector lamp for your NEC NP310 projector. turn off the NEC NP310 projector. Loosen the NEC NP310 projector lamp cover screw. Slide the NEC NP310 projector cover off. NOTE: Your NEC NP14LP projector lamp should be properly recycled because they contain mercury. Loosen the two screws holding the NEC NP14LP projector lamp in place. (The screws will not come out only loosen.) Remo ve the projector lamp by holding the indent and pulling up. Take care not to knock the bulb against the projector as this may cause it to break. Install a new NEC NP14LP lamp into the NEC NP310 projector, gently pressing the projector lamp housing into the socket. Take care not to touch the actual bulb as your finger prints can leave oil marks that burn black marks onto the bulb. Tighten the screws on the NEC NP14LP lamp projector lamp. 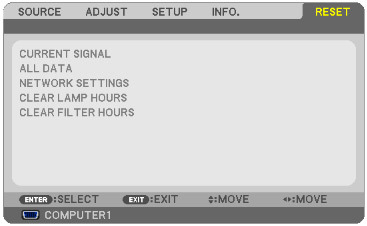 Once the NEC NP14LP projector lamp has been replaced you’ll need to reset the timer back to zero so the . You want the NEC NP310 projector to be able to accurately track the projector lamp life. Plug in the power cord into the wall outlet. From the MENU select RESET.